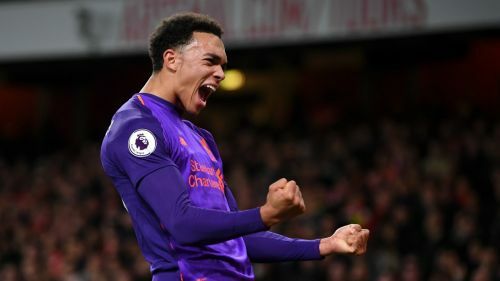 Jurgen Klopp says Trent Alexander-Arnold is "desperate" to face Leicester City with Liverpool struggling for full-back options if the England defender is not passed fit. Alexander-Arnold played through the pain after hurting his knee in the warm-up ahead of a 1-0 Premier League win at Brighton and Hove Albion, but then missed the Reds' 4-3 defeat of Crystal Palace. Initial estimates suggested Alexander-Arnold could be out for four weeks, but he has recovered much quicker than anticipated and could be ready to take on Leicester on Wednesday. Liverpool will hope Alexander-Arnold is available as with Joe Gomez injured, Nathaniel Clyne on loan at Bournemouth and James Milner suspended after he was sent off against Palace they have few options remaining at right-back. Fabinho and teenager Rafael Camacho are possibilities if Alexander-Arnold is not deemed ready to face the Foxes, but Klopp indicated the defender may recover in time for the Anfield clash. "He is better, much better, but we have to see. It needs to be stable – and in the moment it is stable and it's about the pain," Klopp told Liverpool's official website of Alexander-Arnold. "Everyone knows how desperate Trent is to play; he can ignore pretty much everything. That he played that game at Brighton was sensational, to be honest. It's unbelievable. "The same for Gini [Wijnaldum], who got a little injury early and it was very painful. Adrenaline is obviously really hard stuff and gives you the opportunity to grow a bit in the game, so they did. "It will not be long [for Trent], but is he ready for Leicester? I don't know, we will find out. Then it's West Ham and then Bournemouth. After that he will be 100 per cent [back] but until then, we have to see." Wijnaldum may also be able to face Leicester after he also played through an injury against Brighton, Klopp confirmed. "Gini is good, better," Klopp said. "The plan is that he will have one session today [Friday] and then we have to see how he reacts on that. Hopefully we can build from that point." With Liverpool out of the FA Cup, Klopp has taken the Premier League leaders to Dubai for a warm-weather training camp. And the Reds boss confirmed Gomez is still some way from being able to return from the leg fracture he sustained at Burnley in early December. "We have to wait. Obviously it was really unlucky in that situation," he continued. "The injury is not like Trent or Gini where you know 'that's the only thing'. It could have been like that, but then more and more we found out it's a more serious thing. "We have to wait, for sure, a couple of weeks. We will see, it is difficult to judge in the moment. We thought three weeks ago he would be closer and then we had to make another diagnosis in which we saw that it didn't work out so far as we wanted, that's why he is still not in training or running on the pitch."